Here is an excerpt from Robert that was featured in our latest newsletter. He’s marching in another parade today with four students from the Sa-K-La-K-Wel dojo and IC-alum/SLKW partner Gabe Pallo. I am out in the streets and community fully engaged and then I disappear to try and quantify the progress. Our neighbors have already begun to comment on my complete availability and then immediately following, the complete lack there of. It’s near impossible to explain what I am doing in those hours I am unavailable, I can only hope the absolute engagement I do my best to practice helps excuse the absence I cannot rightly explain. 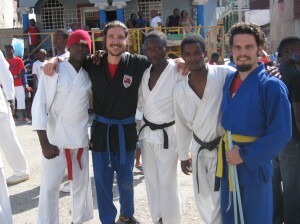 This Sunday Gabe and I were invited to visit a Shotokan Dojo in Jacmel to take class. After about 30 min of waiting it dawned on us that they were about to march in a Sunday Carnival parade, and we both smacked our foreheads for being lost in translation yet again. We both put on our Kimono’s and lined up trying not to let our incredulous glances be seen. A black belt that we have come to be friends with called us over to a trash pile and broke to rods off an old projector stand. “Epe”, he said, handing us the rods. Next thing we knew, we were marching in the Carnival with one of Jacmel’s best known Dojos. At first we just performed our Sword form one Kata together, but as the two hour march in the mid day sun wore on, they were calling us up every time the group stopped. They would perform Shotokan Katas and then throw us up there to see what we came up with next. Gabe showed off some of his Katas and I did a sai form, we finally resorted to doing self defense Kenpos and that really went over well. Two hours and a light case of heat stroke later, we had been accepted into the group, and gained an enthusiastic new Shotokan sensei. I know that this may seem separate from the Indy Convergence, but is exactly the type of experience that our work with SLW provides IC artists.The opportunity to walk out your door and find yourself more deeply engaged in the things you love by practicing the art of saying yes. This Sunday, it was Karate for Gabriel and I, but the same moment of acceptance and inclusion can be found for any artist here. The tenants of what we practice at the Indy Convergence set visiting artists up for success anywhere in the world and in the creating of any new work. Say yes, Don’t be precious, Share what you know unreservedly, and do what you can the best you can- It is in those moments that you are the best artist you have to offer the world, and in those moments that the way forward will reveal itself with open arms.